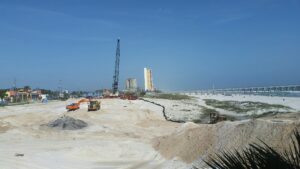 Take a look at the future home of SpringHill Suites located in Panama City Beach. Acting as the Geotechnical Engineer of Record, local NOVA staff just finished the test pile program for this new beachfront development. The site is now being prepared for deep foundation installation.